The TSL2572 device family provides ambient light sensing (ALS) that approximates human eye response to light intensity under a variety of lighting conditions and through a variety of attenuation materials. 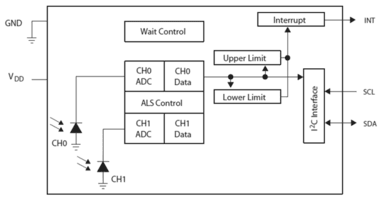 Accurate ALS measurements are the result of ams’ patented dual-diode technology and the UV rejection filter incorporated in the package. In addition, the operating range is extended to 60,000 lux in sunlight when the low-gain mode is used.